The highlight of the day was definitely worshipping with a congregation of about 130 Bhojpuri people in Varanasi. Their facility was approximately 30 feet wide by 60 feet long, so it was definitely cozy. And lively!! (I especially appreciated the chairs for the guests – us – as everyone else was sitting on the floor.) It brought to mind the scene in Revelation 7 where “a great multitude that no one could count, from every nation, tribe, people and language were standing before the throne… and worshipped God.” The people were so gracious to us and welcomed us with garlands of marigolds. As you gather for services this weekend, please do not take our freedom of worship for granted. On the flight this morning we read in one of the local newspapers an article telling of an attack on a house of prayer in a nearby Indian state. One of the seven who was injured was an 80 year old woman; she was beaten simply because she had gathered for prayer with fellow believers. We also saw newspaper and television headlines that homes of Christians in neighboring Pakistan were burned as part of religious persecution. 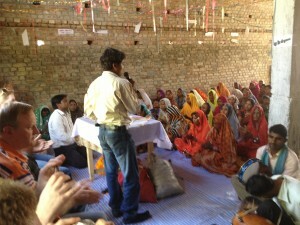 Please continue to pray for us as we continue to learn from and share with our brothers and sisters here in India.